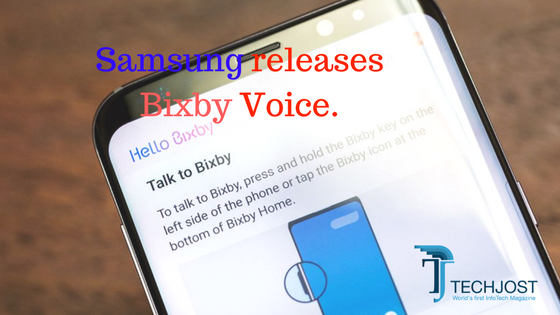 Samsung today launched the Bixby Voice Assistant for its native Galaxy S8 users in Korea reported by ZDnet. Bixby is the Samsung’s newly launched digital assistant although currently; Bixby currently only offers Galaxy S8 users limited features. Samsung hasn’t commented yet about; when it’s planning to launch its Bixby voice assistant in U.S and other markets around the world. Bixby was initially launched alongside Galaxy S8 in April last month. The Korean users can now command Bixby to perform multiple activities like; making calls, launch or close apps, set alarms and reminders etc.. It’s believed that U.S Samsung Galaxy users will also receive the Bixby voice assistant in upcoming weeks or days. Prior to the Galaxy S8 launch Bixby was the core feature during the Samsung’s marketing campaign but, Bixby’s limited features has disappointed many of Samsung users. There’s no doubt that, Bixby is the top most anticipated feature immediately upon the Galaxy S8 was announcement. But, its delay hasn’t affected the sales of Galaxy S8 models; which Samsung believes will doubles the Galaxy S7 sales. Samsung has developed Bixby in-house with the team of developers, who’ve previously developed iOS and then sold it to Apple Inc.
Bixby is the newest addition in the digital assistant industry; which has players like Alexa, Siri, Google Now and Goggle home. Galaxy S8 models are coming with two digital assistants; Google now and Bixby. It’s interesting to see whether Samsung will be launching Google’s digital assistant in Galaxy models in coming years. Galaxy S8 has been a hot topic since its launch last month. Initially, there were issues about a tinted red display, which company later fixes in a software update. But, last week hundreds of users reported on Samsung community page that their Galaxy S8 is randomly rebooting. Some even reported that their phone was rebooting even when they aren’t using any apps.